Many dismissed public servants, including police officers and teachers, found themselves working at unskilled jobs in the labor market in wake of coup attempt on July 15, 2016. Dismissed following decrees issued by the Turkish government in the aftermath of a coup attempt on July 15, 2016, many public servants, including police officers and teachers, found themselves working at unskilled jobs in the labor market. Turkey Purge managed to compile real stories from a group of victims of ongoing purge. S.K., a religious culture and moral knowledge teacher of 12 years now works as a cleaner at an Adana company in order to make his living. According to a Facebook post on March 1, S.K. was dismissed from profession with a decree issued by the government in the aftermath of the coup attempt. “After working as a religious culture and moral knowledge teacher for 12 years, this is my new job. Hi from Adana. Regards,” S.K. said. He also pinned a photo of himself holding a cleaning brush. Apart from massive arrests, Turkish government has dismissed more than 120,000 civil servants, among them police officers, teachers and academics, during the State of Emergency since July 15. In another example, B.Ç.A., a primary school teacher of 20 years, has recently started working as a textile worker. According to her Facebook post on March 3, B.Ç.A., “thanked god” and said she finally managed to find a job. She also posted a photo showing herself folding sheets she had produced. A.K., one of the hundreds of dismissed police officers, now works as a construction worker in order to make his living. In his Facebook post on March 5, he said that he was dismissed from profession with a decrees, numbered 679, on Jan. 6, 2016. The very same decree dismissed around 10,000 civil servants, including 2687 police officers as well as 149 soldiers from the naval forces, 164 from the air force and 649 academics are from universities. In another example, Y.A. 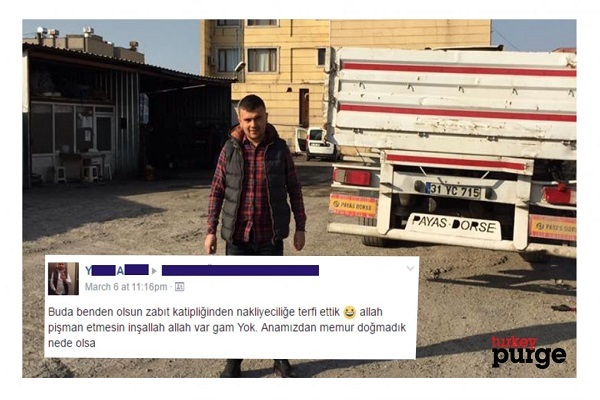 a court clerk of 5 years now works at a transport store in Mersin in order to make his living. According to a Facebook post on March 6, Y.A. was dismissed from profession with a decree issued by the Turkish government in the aftermath of a coup attempt on July 15, 2016. “Just got promoted from being a court clerk to being a shipping agent. No problem. It is not like we were born as civil servant,” Y.A. said in his Facebook post. He also pinned a photo of himself working the transport store. Y.E. 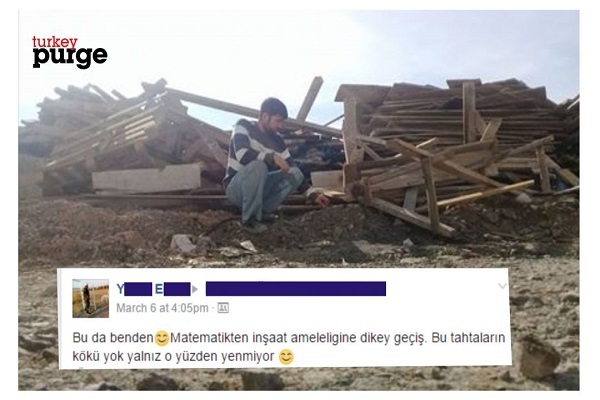 a math teacher of ten years, now works as a construction worker in order to make his living. According to a Facebook post on March 6, Y.E. was dismissed from profession with a decree issued by the Turkish government in the aftermath of a coup attempt on July 15, 2016. “Vertical transmission from mathematic to construction labor,” Y.E. said in his Facebook post. Ahmet Kaya, a Turkish-Kurdish singer from Malatya, Turkey.